Dale Gilbert Jarvis: Title and cover art reveal for the new ghost story book by Dale Jarvis! Title and cover art reveal for the new ghost story book by Dale Jarvis! As many of you know, I've been working on a new compilation of ghost stories, to be published Fall 2017 by Flanker Press. 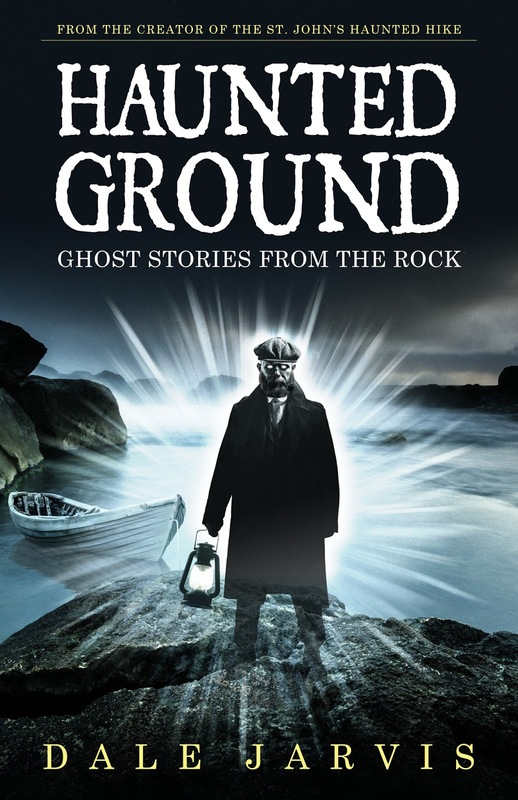 Now, I can reveal the title: "Haunted Ground - Ghost Stories From The Rock." Even more fun, I'm delighted to be able to share with you the cover art for the book, designed by the talented Graham Blair. Graham did the layout for my previous book, Any Mummers 'Lowed In, and I'm pleased to have him back working on this new project. Stay tuned! I'll keep you informed on possible release dates, signings, and live performances, hopefully all coming your way in time for Hallowe'en 2017! Can't wait till then to hear a good ghost story? Well, the St. John's Haunted Hike is back up and running for it's 20th anniversary! Check us out at www.hauntedhike.com.